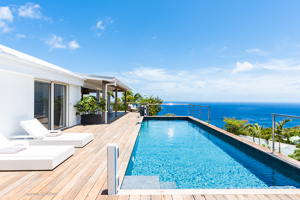 Villa UJV 297, also known as Villa Avalon, is just an 8th of a mile to gorgeous Gouverneur Beach. This four bedroom villa is conveniently located for exploring the island and boasts a quiet location. It is a perfect for reading and relaxing. Beautiful ocean views from almost every room invite you to relax and enjoy your island surroundings. Sun lovers will enjoy the southern exposure on the pool deck for long days lounging by the lap pool. The fully-equipped kitchen will delight guests looking to experiment with some of the local and French ingredients the island has to offer. Gather around the large outdoor dining table to enjoy the Caribbean breeze. Three equal bedrooms are on the main level and a fourth bedroom is located on the lower level.